I'm a huge fan of CodePen (No, they didn't pay me to write this). I'm using it for prototyping, experimenting, sharing code, and in my latest blog post, The Dark Side of the Grid, I'm also making use of their Embedded Pens. CodePen allows you to customize syntax highlighting, and background and text colors of UI elements in Embedded Pens. As a PRO user, I can also add custom CSS, which gives me the ability to improve Pens not just visually but in terms of accessibility. Before I tell you where I see room for improvement, I want to highlight what they did well. You can customize colors and make sure that contrast ratios are high enough. There's a click-to-load option. Pens can be in a preview state where they need to be clicked to loaded, which is good for performance. All buttons and links in Pens are HTML <button> and <a> elements with actual text (What a time we live in that this makes me happy). Embedded Pens are iframes. There's a title attribute on each iframe with the title of the Pen as a value. This is important because screen readers announce this value when the iframe is focussed. If the attribute is omitted, VoiceOver for example, falls back to the name attribute. This can be annoying, especially if the value of the name is a long hash. 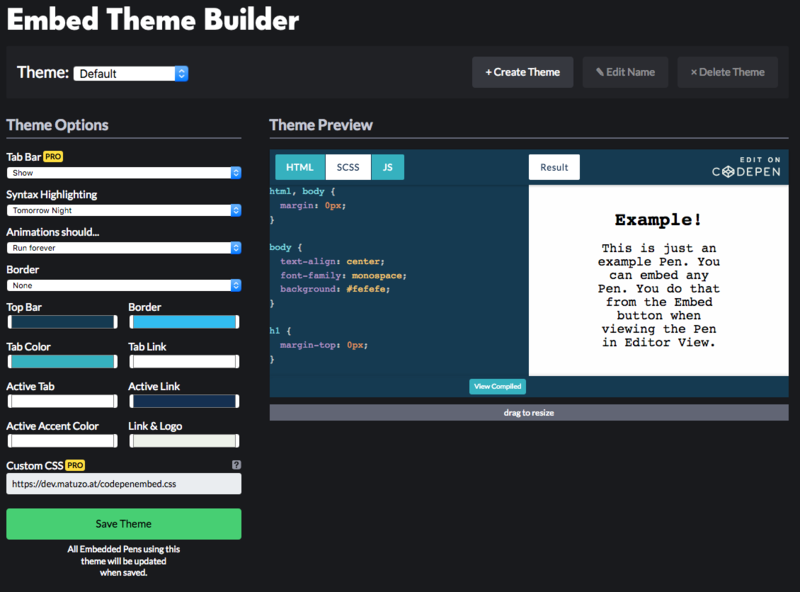 The CodePen is named “Buttons demo”. VoiceOver annouces the name because it’s the value of the title attribute. It falls back to the name attribute if the title is omitted. I use the keyboard a lot, even on the web, and I want to make sure that other keyboard users get the best possible experience on my website. The outline property highlights the “CSS” button on focus. Wait! What?Why did you add transform: rotate(0);? To make sure that other items don't overlap the outline of the focused item, I create a new stacking context on focus by applying the transform property with a value that doesn't change anything else visually. transform is just one of many other properties that create a new stacking context. As part of my testing, I discovered that in Firefox on macOS 10.13.6 a pre element within the iframe receives focus as well. That's why added the following lines. Note: I’m setting the outline property to a negative value because otherwise the outline wouldn’t be visible due to a overflow: hidden rule on one of the pre elements parents. All focusable elements are now clearly highlighted. Let's say, you're not interested in the embedded Pen. As a mouse user, you just keep scrolling. As a keyboard user, you have to press Tab at least 9 times until you get to the next focusable element. Or worse, you get trapped in the Pen. This happens if the Pen is editable. You can pass the buttons in the top bar but the journey ends as soon as you get to the pre element where the code is displayed. Once you're in there, there's no way of getting out. There's no way of escaping the code area in an editable Pen. We can't fix that issue but we can give users more options. You might have heard of skip links. If not, please read Skip links are important by Nicolas Steenhout. A skip link is a link that’s usually only visible on focus and lets users skip large parts or repetitive blocks in a page. They're often the very first item in a page. Skip link on Max Böcks website. Sometimes it also makes sense to add in-page skip links. For example when you want to give users the ability to skip components or widgets in your page with a lot of links, like social media embeds, videos, or CodePens. That’s exactly what I did in my blog post. Directly before the embed code for the Pen, I added a div with an anchor link to an element that comes after the Pen in the DOM. By clicking this link, users can skip everything between the link and the target. By default, this link should be visually hidden and only visible on focus. It’s not enough to just apply display: none and remove it on focus. To ensure that the link is still accessible to screen reader users, it's necessary to get more creative. This is a great improvement because we’ve reduced the number of key presses needed to skip the Pen from 9 to 1. There’s just one more thing I want to add. Since the page jumps from the anchor link to the target and the skipped area might not be in the viewport anymore, users might become lost. To help with that, we can give them a visual feedback after the jump has happened. And this is how the final result looks like. Watch the video or try it yourself. Focus styles are clearly visible and users can skip the entire Pen. Keyboard users benefit the most from my proposed improvements. I haven't tested how accessible embedded CodePens are for screen reader users but Scott O'Hara, who reviewed this article, told me that he had difficulties using Pens with VoiceOver in the past. So, the next thing I (or you? 🙂) could do is to test CodePens with several screen readers and share the results. Until then, keep on making awesome websites for everyone. If you have any questions or feedback, please find me on Twitter or write me an e-mail.